It was a somber end Friday to the last bridal collection created by the late Amsale Aberra, closing silently with the first gown she ever designed for her namesake line — a sleek satin column look with an illusion neckline from 1990, when so many brides favored huge ball skirts and pouffy sleeves. The music was shut off and only the clicks of photographers’ cameras were heard as the model in Aberra’s “A101” dress walked on a terrace of the Gramercy Park Hotel, on the city’s first warm and sunny day of spring. The model was of Ethiopian descent, Aberra’s native country, showing off the gown after a short video played of Aberra talking about her work. 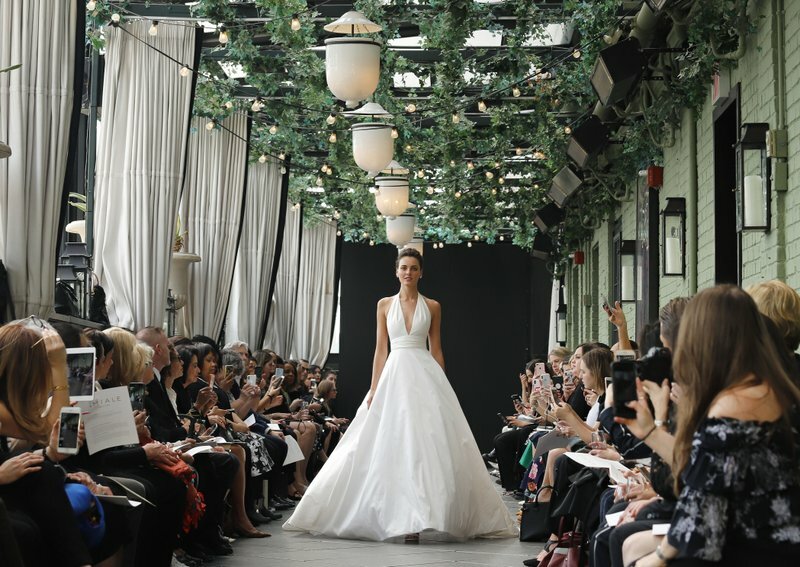 The bridal designer died April 1 at age 64 after battling uterine cancer. She worked until the final fitting on the Spring 2019 line two weeks before her passing. Her death was relatively sudden, said her husband and the Amsale company’s president and CEO, Neil Brown. Brown and the couple’s 30-year-old daughter, Rachel Amsale Brown, were in the audience, greeting friends and admirers before and after the show. Sarah Swann, Amsale studio director, said in a pre-show interview that the collection honors Aberra’s famed simplicity, but Aberra also had cathedral elegance on her mind. That played out in a pocket collection, Amsale Blue Label, offering upscale ballgowns, pearl and crystal beading and draped bows. “She wanted this bride to feel regal,” Swann said. Aberra arrived in the United States from Ethiopia at age 19, but not to study fashion. There was no market for that back home. At first she took on commercial art, then political science, a degree she earned but “which she quickly decided she didn’t know what to do with,” her husband said. Her studies were disrupted by revolution and the overthrow of Ethiopia’s emperor, Haile Selassie, Brown said. She was forced to take menial jobs to support herself after her father became a political prisoner. Brown said he and Aberra met in Boston, where they lived in the mid-1970s. It was at a party, after Brown conjured up the confidence to chat up the “stunningly beautiful” girl he knew from the Harvard-area coffee shop where she worked. Brown moved to New York first after graduation. Aberra followed and soon enrolled at the Fashion Institute of Technology. She later joined the school’s board of trustees and remained a member until her death. She went into the bridal industry after searching to no avail for a wedding gown she liked for her own nuptials in 1985. She made one herself instead.